A hung assembly is on the cards after the elections to the Karnataka Assembly ended on Saturday, May 12. 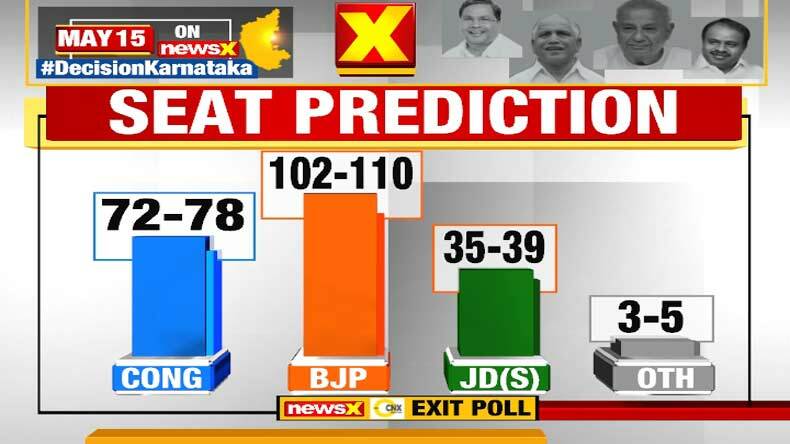 The BS Yeddyurappa-led BJP is set to be elected the single largest party in Karnataka with close to 102-110 seats, followed by the Congress with 72-78 seats and JDS with 35-39 seats, according to the NewsX-CNX exit poll. A hung assembly is on the cards after the elections to the Karnataka Assembly ended on Saturday, May 12. 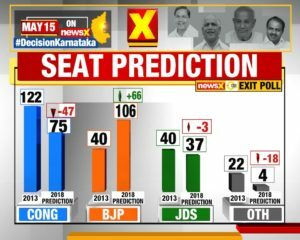 The BS Yeddyurappa-led BJP is set to be elected the single largest party in Karnataka with close to 102-110 seats, followed by the Congress with 72-78 seats and JDS with 35-39 seats, according to the NewsX-CNX exit poll. The Congress won 122 seats in the 224-member Karnataka Assembly in 2013 but that was primarily because Yeddyurappa had floated a rebel outfit then and had split votes for the BJP. 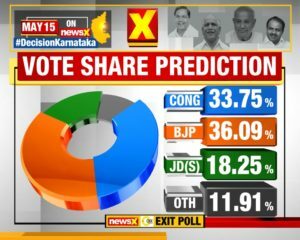 Talking about the vote share of the 3 parties, the Congress might get a total of 33.75%, BJP 36.09% and the JDS might get around 18.25 while other may get somewhere around 11.91%. 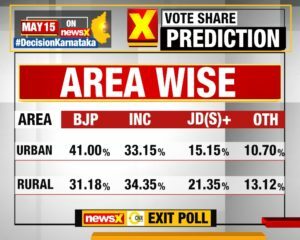 Comparing the predicted vote share for 2018 with what it was in 2013, then Congress got 36.59%, BJP got 19.89%, JDS received 20.19% and others settled at 23.33%. 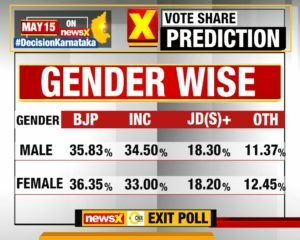 The NewsX-CNX exit poll 2018 predicts a hung assembly with BJP as the single largest party. Take a look at seat share which the parties had got in 2013 and comparison with the prediction for 2018. In 2013, the Congress party got 122 seats, BJP and JDS with 40 seats each while others settled down at 22. Voting for 222 of 224 seats was held on Saturday. The state saw 64.35% polling in the high stake elections. Polling in two constituencies — RR Nagar and Jayanagar, both in Bengaluru — did not take place today as the Election Commission had postponed elections after around 10,000 voter ID cards were found at a flat in Bengaluru. While the elections in the state are over now, all the three leading parties — Congress, BJP and JDS — put up a tough fight and led a power-packed campaign to woo voters in the state. 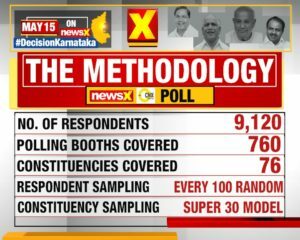 Karnataka elections are being seen as one of the most important polls ahead of the 2019 General Elections. A win for either the BJP or the Congress will boost their campaign and morale for the Lok Sabha polls next year and may herald a change in the political perspective in the country. 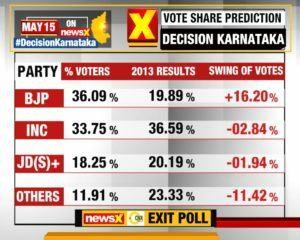 For BJP, a win in Karnataka is important as it has to show that the popularity of Prime Minister Narendra Modi and party’s winning streak is still continuing while for the Congress, a win in Karnataka elections will help party’s cadres regain confidence and represent a strong opposition against the Central government. 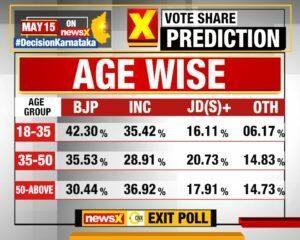 Anti-incumbency has been a strong factor in Karnataka historically but very low voter turnout in the cities indicates the BJP may not do well in its strongholds of the urban landscape.